Good morning, friends. It’s Wednesday, which means I got up early today to drop my brother off at the bus stop. He sleeps over on Tuesdays after D&D and takes the bus to work in the morning, but the bus stop is at the bottom of a giant hill so I drive him down so he doesn’t have to walk. This morning started out totally normal, us meeting in the living room and waiting for the right time to leave so he wouldn’t be waiting super long at the bus stop but also wouldn’t miss the bus. Calamity was looking out the window, intently as always. That’s when we noticed them. Turkeys. We had a family of turkeys around last year. They’d hang out on our road or in the grassy space by our parking area. There was a mom and at least ten babies who wondered around. I guess we’ll be seeing more of them this summer. 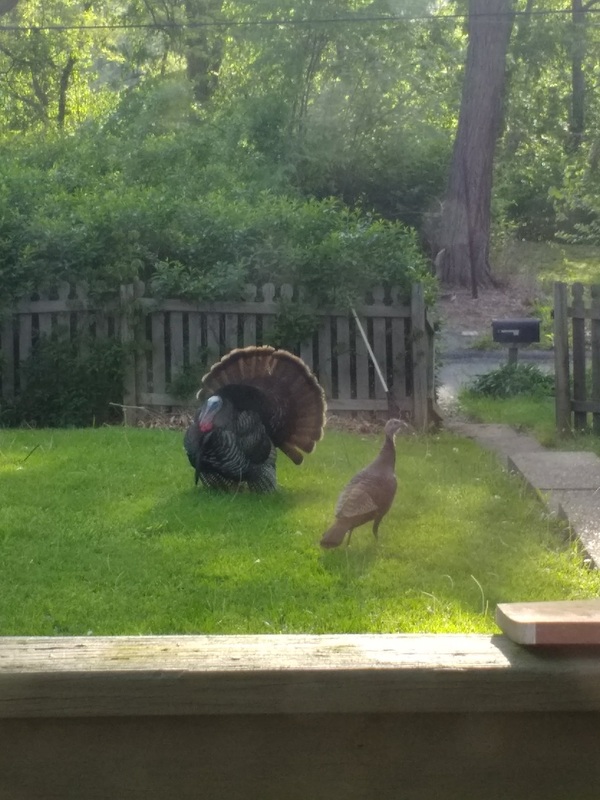 When we looked to see what Calamity was so interested in, we found two turkeys strutting around the yard. A hen, smaller and a lighter brown, wandering around, minding her own business, and a tom, all poofed up and strutting his stuff. He had his tail up and his feathers out and he was making a very big show of himself. His lady friend didn’t seem terribly interested, though, as she wondered off towards the neighbor’s yard. He deflated a little as he followed her, but poofed up again when he got closer to her. This isn’t the kind of thing I’d think to see out here in the suburbs. Sure, we saw lots of turkeys around my parents’ place growing up. We lived near the woods and it was super common to see them dodging across the road or wondering the fields. I didn’t think there’d be that many in a place that’s mostly houses, but I guess we have enough woody spots to support a turkey population. We had turkeys at our old apartment too. We’d see them on some mornings, hanging out down the back road behind our building. They’re super chill out here. They just chill on the road and sort of shuffle off if a car comes. Last year my mom-in-law came to pick me up for lunch the one day and they were all laying around on the side near our parking spot. They didn’t even flinch as she pulled in, or as I walked right past them to get into the car. It was a little scary, as turkeys can be aggressive when they want to be. But they didn’t seem to acknowledge my presence at all. Even when mom backed out and drove off they didn’t react at all. Turkeys around here are nuts. So that was the excitement of my morning. It was pretty cool to see them doing their thing. The tom all puffed up was pretty impressive, even if the hen seemed underwhelmed. I hope he gets the girl. He was working pretty hard for her. Last we saw he was strutting off down the road, still all poofy with his tail up and everything. Not sure where the hen went, but I’m sure he’ll find her, and woo her and then we’ll have little baby turkeys running around. It’s nice to have that little piece of home here in the suburbs.